A court in Sicily ruled on Thursday that Italy's far-right Interior Minister Matteo Salvini can be charged with kidnapping after he prevented refugees from disembarking an Italian coast guard ship in August. "I confess," Salvini said in a video posted to his Facebook page, "there is no need for a trial. It's true, I did it and I'd do it again." "I risk 3 to 15 years in prison for blocking illegal landings in Italy. I have no words," wrote Salvini, the leader of the ultra-nationalist Lega (League) party, which now rules Italy in a coalition with the anti-establishment Five Star Movement (M5S). Salvini also claimed on Facebook that #SaliviniNonMollare ("Salvini, don't give up") was the top trending hashtag on Italian Twitter, but many of the tweets were English-language posts declaring solidarity with Italian nationalists. The charges against the interior minister were launched by prosecutors in the Sicilian city of Catania, who say that Salvini effectively held 177 migrants hostage when he refused to allow them off the Italian vessel Ubaldo Diciotti, which had rescued them in the Mediterranean. After nearly a week trapped on the boat, Ireland, Albania, and the Catholic Church agreed to resettle the refugees, most of whom had fled conflict and poverty in Eritrea. Salvini, who is also deputy prime minister, has pursued a series of hardline immigration policies that went into effect in December, known as "Salvini's decree." Part of the new laws include the shuttering of Italy's refugee centers and mass deportations. According to the Italian daily Corriere della Sera, on Wednesday, a report about Italy published by the European Council expressed "concern" about the increase in "incitement to hatred by politicians, particularly in the media and on the internet." France has also voiced its worries that Italy is abandoning its Europe principles, prompting Salvini to demand President Emmanuel Marcon step down, a major breach of diplomatic codes between two EU members states. 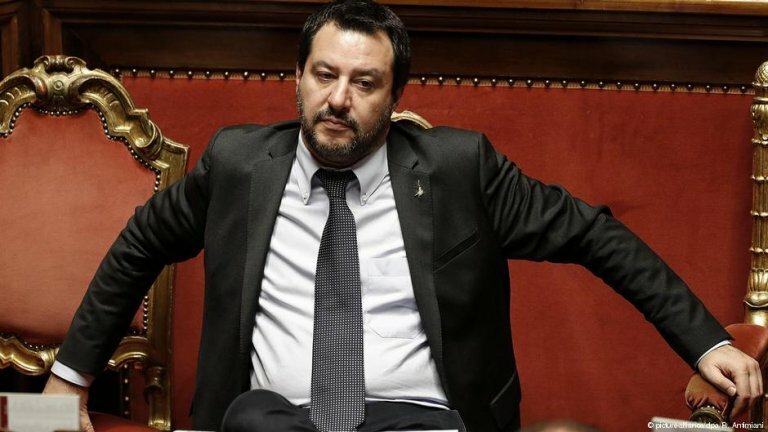 Due to his position, Italy's parliament must now decide whether to allow Salvini to go to trial or to postpone the process. It remains to be seen whether coalition partners M5S will stand behind the interior minister, considering their roots as anti-corruption left-wing populists.